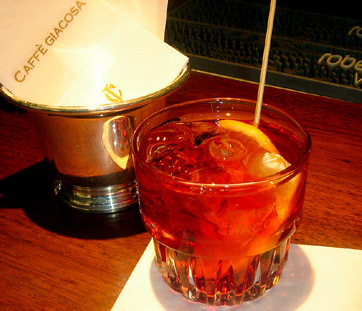 Negroni is the only Tuscan cocktail recognized by the IBA (International Bartender Association). ( a traditional Italian bitter), served in an old fashioned glass, on the rocks, and garnished with a slice of orange. It is today, the most popular aperitif cocktail in Italy. It was invented in 1919 at Caffe’ Casoni, today called Caffe’ Giacosa, a beautiful and historic bar in downtown Florence. Count Camillo Negroni invented it by asking his bartender, Fosco Scarselli, to strengthen his favorite cocktail, the Americano, by adding gin rather than the normal soda water. The bartender also added an orange garnish rather than the typical lemon garnish of the Americano to signify that it was a different drink. The legendary drink was born and everyone started ordering it “Americano alla Negroni”. The name was soon changed to Negroni. It is now, one of the twenty three official pre-dinner IBA cocktails. Next time you are in Florence, make sure to stop at Caffe’ Giacosa in Via della Spada and order a Tuscan classic: ” Un Negroni”….